Fashion accessories play a vital role in enhancing your physical appearance and glamorous outlook. Therefore the spectrum of stylish and fashionable eyeglasses in this season is not only exclusive and different but also offers wide horizon of features ranging from artistic explanations, mind-boggling combo and fusion of refreshing colors. So the list of upcoming popular eyeglass styles for this winter season is as follow. You might have come across those rather heavy framed glasses that makes you want to die . But guess what, these glasses are pretty hot now. They suit the individuals who have oval, heart or round-shaped face. If you have a more rounded or angulated face, try chunky bold frames to compliment the natural alignment of your face. We all remember this highly exotic and trendy style of frames that were first rolled out in 1950’s and 1960’s. Although, for some classy women, this style was never dated but to all the ladies who ever developed an indulgence for cat eye frames, you should know that this style is back in fashion with a bang. The cat eye frames are rounded with slightly elevated or pouty appearance near the temples. It enhances the beauty of wearer by its highly refined, dignified and peculiar look. 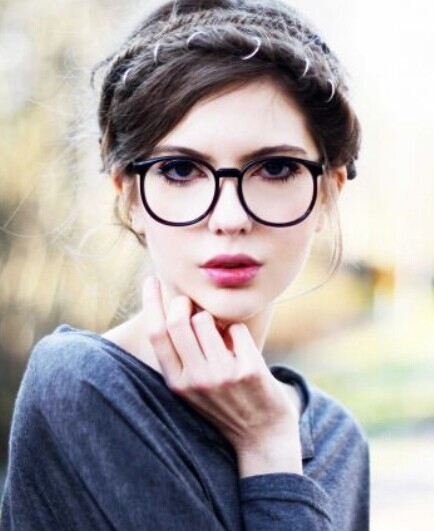 These eyeglasses give an even adorable look to the women who have diamond or square-shaped face. Moving on from the customary impressions, the exaggerated wayfarer is the ambit that keeps you in contact with this appetizing and sensational fashion world. The history of this style dates back to 1956, when they were first released. These eyeglasses are characterized by trapezoid frame and heavy rims. You can also get aggressive wayfarers that are characterized by retro pins for a bold charisma and muscular look. This heavy look transmits an impression of confrontations and liberty. People with oval, oblong, round or diamond shaped face are perfect candidates for this style of eyeglass. This style of eyeglass is perhaps the oldest, with completely round frames and traditional classy look. The shape of the frame is curvy making it uniform thoroughly with tall and wide rims. The classic shape of the frame cushions highly angulated faces to enhance the stylish looks. These glasses are best for people with heart, oblong or square-shaped face. This style is a vintage throwback from the past. Over-sized round means that they are larger than traditional round frames. Previously popularly used by auditors and accountants, this style has now adopted and perfectly embraced by fashion divas. These fit best with oblong, heart or square faced people and works even better with people with square jaw and slender face. Eyeglasses with extra decoration are in fashion nowadays. So this year, be a little daring and choose eyeglass with multi-colored frames. Besides you can also add different metals and spectrum of colors on the rim, edges or other details. You can also select frames that have extra arts on it whatever the style may be. Plus you can cut your frame in any way you desire. Once you are done with selecting your favorite fashionable and stylish eyeglasses, it is now the turn to select the print or color. It is really difficult to make a choice among so many colors because when it comes to color people try to choose the eyeglasses that can suit their skin tone and at the same time boost their costumes beauty as well. Here is a list of some very attractive colors and print for this year. Obviously if you are wearing attractive and fashionable eyeglasses, more people tend to notice your eyes (more than other facial and bodily features). It is therefore recommended to be very careful with the eye makeup to support and enhances the beauty of eyeglasses and not give a cheesy look. Below are some useful tips regarding makeup. Colors that are heavy, dazzling and stable should be used, like shocking pink, coral, and red. These will look extremely beautiful with any type and style of eyeglasses. If your eyeglass has soft warm touch, then you can use the same tone on your eyes as well. But don’t exceed the eye shadow beyond the line of frame as it may gives a distorted or messy look. Decorate your eyes with eye pencil, mascara, eye liner. If you have thin frames use thin eye liner. Try using waterproof makeup so that eyeglass does not get smudgy. Your eyes appear bigger, brighter and cuter especially with the popular eyeglass you are wearing. When a person wears eyeglasses, their eyes becomes more noticeable to masses. So make sure your eyes are fully covered (in terms of marks, bags under eyes and dark circles) to enhance the classic fashionable look. Eyebrows further helps to enhnace the beauty of your eyeglasses so make sure they are properly trimmed and tweaked. Adequately blush is a profound way to look beautiful and fresh with eyeglasses, make sure to maintain a sweet blush on your face.